Take the slicing plane and start moving it slowly toward the apex of the pyramid. As you watch the inner box getting smaller imagine the outer box getting bigger. As the slice gets near the apex, the inner box gets really small. Correspondingly the outer box is getting really large. The outer box is also becoming larger at a faster rate. As you get close to the apex the inner box is very small. Simultaneously the outer box is reaching out through the universe. The inset in the upper right shows a side view of the slice reaching. The pyramid has perfectly sharp edges being made up of four geometric planes. The intersection of the slicing plane and the pyramid is one geometric point. 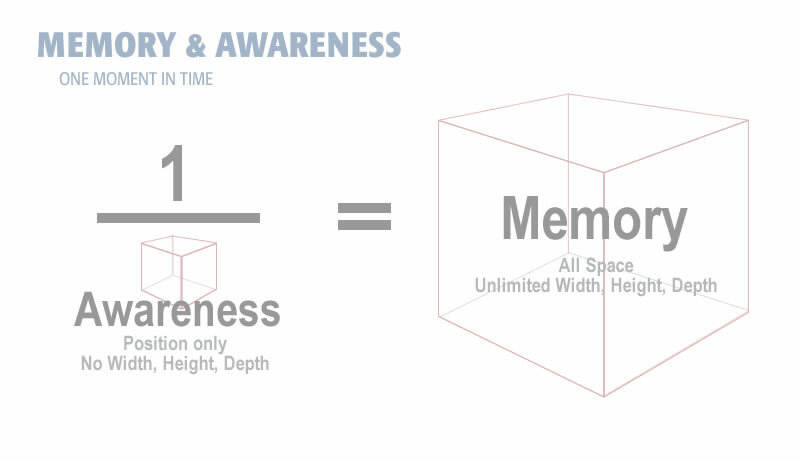 At this moment the inner box has no length, width, or depth but it does exist. 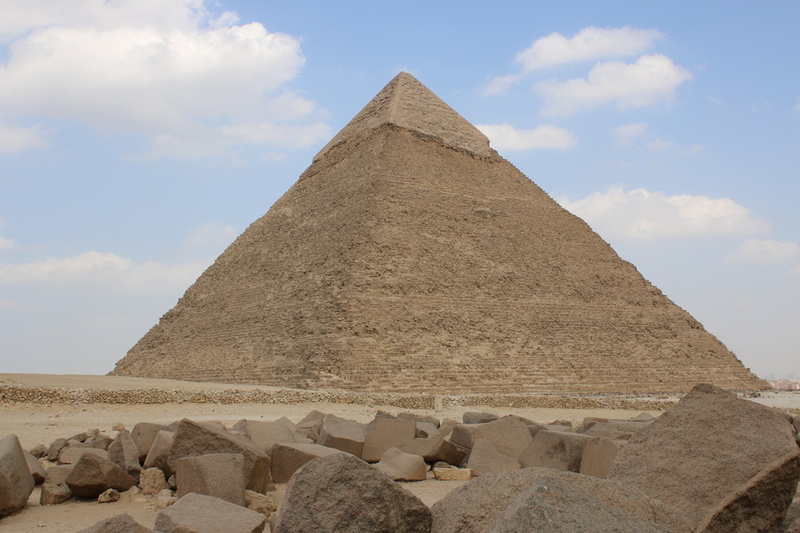 The inner box is a point sitting precisely at the apex of the pyramid. This is the tricky part. I cannot accurately draw this. 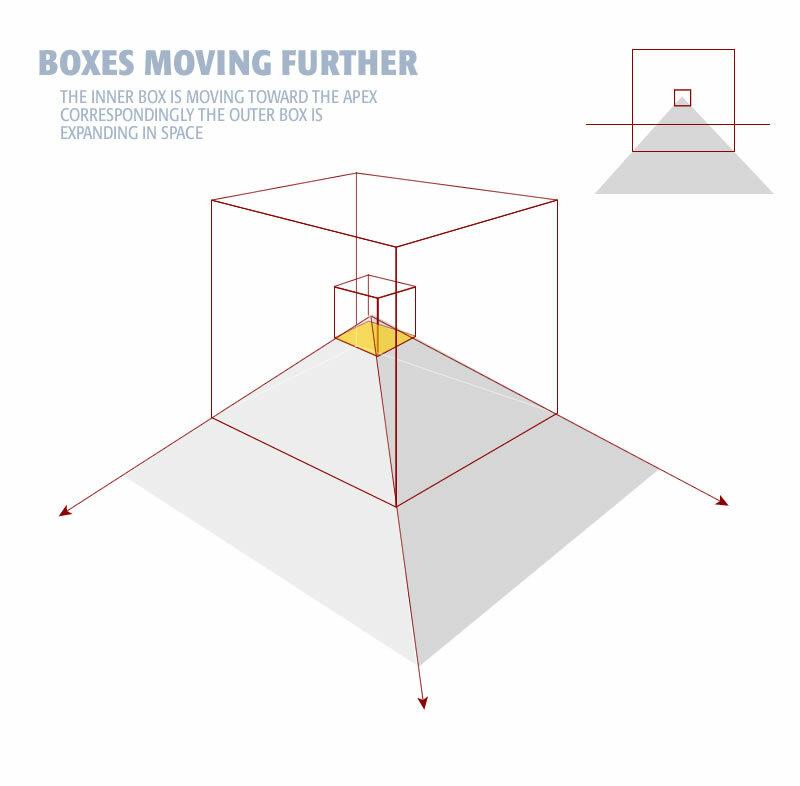 Imagine what has happened to the outer box when the inner box became a point. This single concept unlocks the key to afterlife. The outer box is the inverse of the inner box. 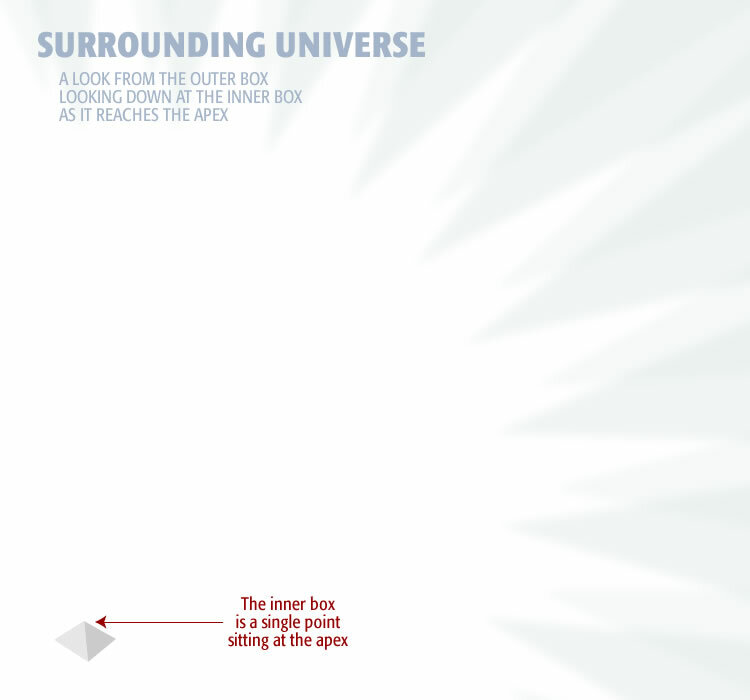 As the inner box becomes a point, the outer box the universe. Here we are, sitting at the far reaches of the universe, looking down at the inner box. 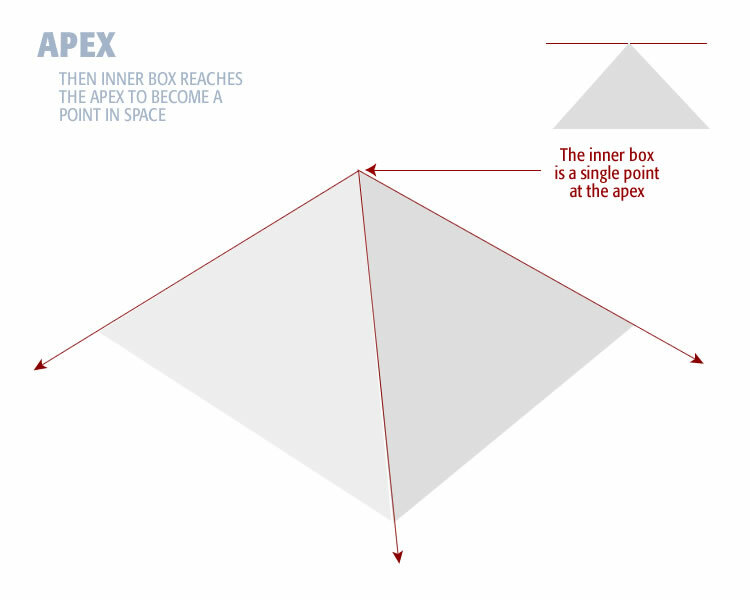 At the apex of the pyramid is the inner box, now a single point. You are somewhere in the outer box looking down at its inverse, the inner box. What you are seeing is conscious awareness from the perspective of your memory. The outer box, now the universe, is memory. The inner box, now a point, is conscious awareness. The view above is from your memory looking down at your conscious awareness. During life we see things from the inside out. This is the opposite view. This is a view of life from the outside in. The point you are looking down at is you. This is your point of view within time and space. Where you are now is in memory. This is what life looks like from the perspective of memory. During life you will not see this view. 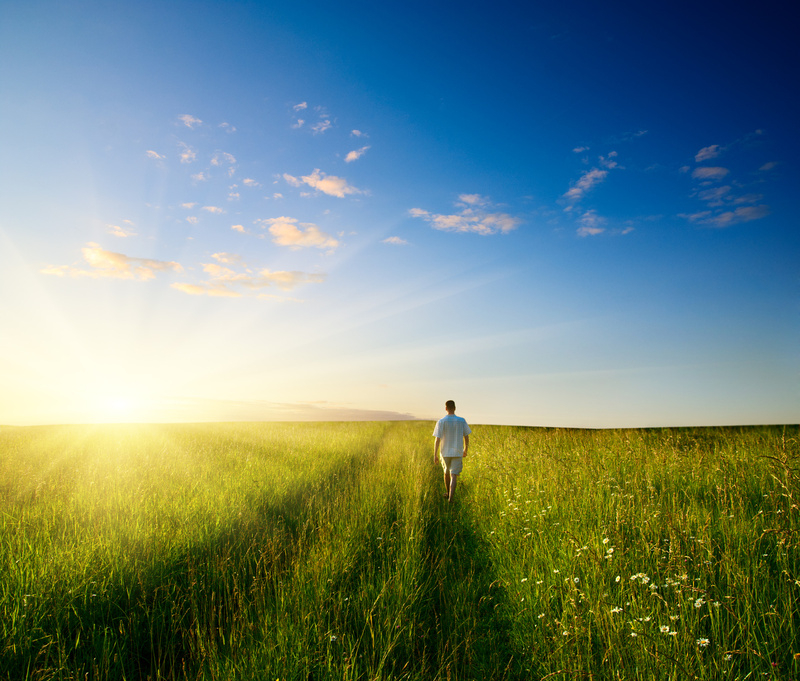 We have a tendency to see life as conscious awareness within an outside world. That only represents the lower left side of the equation. Life is the entire equation. Life includes both conscious awareness and its surrounding memory. The two are inverses of each other. Your mind extends to the reaches of the universe. Everything happens within the mind. There is no outside. Everything is inside. Geometrically life is a system of a point surrounded by space. Our discussion thus far however, has dealt only with the present. To prove afterlife we must consider time. We will consider memory, awareness, and time in the next section.